UCSD is making the most of their weather-induced lack of fields, prioritizing out of region matchups. Ultiworld’s reporting on Presidents’ Day 2017 is presented by VC Ultimate; all opinions are those of the author. Please support the brands that make Ultiworld possible and shop at VC Ultimate! Some wet and windy weather earlier the week and forecast for the next few days has shifted the schedule around, but the Presidents’ Day will go on as planned this weekend (almost). 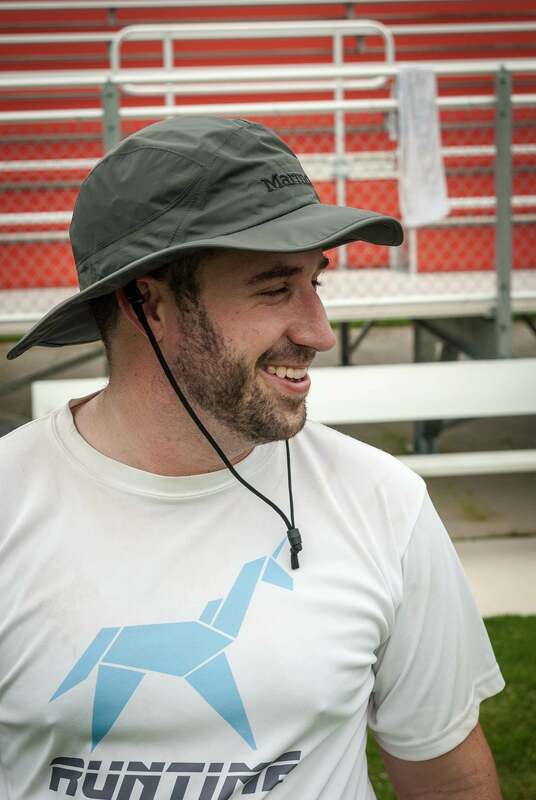 Scheduling changes will be discussed down below, but the real excitement this weekend will be watching #1 Oregon and #5 Colorado dust off their rosters for the first time at a major tournament this season, while three more competitors from the Ultiworld Power Rankings take the field for the second time this season to improve themselves. One of those contenders might have enough up their sleeves to snag a big upset if Ego or Mamabird don’t show up ready to play. Lanky handler Colton Clark steps into a full-field outside-in backhand that bends around his mark, the strike cut, strike cut defender, and the downfield defender fronting; hugs the sideline; and slides into the eager clap catch of Connor Matthews. Nascent offenses early in regular seasons typically don’t get completions here, and a majority of coaches might bench a handler for a point after gambling on a same-third huck. But with Oregon, plays like this work. Both key players return this weekend to join an otherwise healthy roster, after missing the team’s first weekend of competition at Flat Tail. That’s just a taste of what the Ego offense brings. Alongside Matthews, there’s cutting firepower to be had from Adam Rees, Will Lohre, and Xander Cuizon-Tice. Clark will continue his work in the backfield with speedy reset-man Braedon Petrus. The only way to slow this group down in the early going will be taking advantage of mistakes and overconfidence. Teams might have better luck against the Oregon D-line — as is now annual tradition, that’s where the questions lie for Ego. Much of what Oregon has done in the past on defense has relied on sheer athleticism, talent, and emotional drive, complicated schemes be damned. Ego plays a lot of person defense and relies on the above three traits to get blocks. Sophomore Leandro Marx stood out early as a rookie for his work on defense. He and Lohre are both candidates for leading the D-line this weekend, and it wouldn’t be a surprise to see Rees and Matthews cross over when the team is in need of a break. The tests for Oregon this weekend likely won’t come until power pools on Sunday, or even as late as bracket play on Monday. USCB Black Tide are over-seeded at second in Pool A and eighth overall at the tournament, despite lackluster finishes at their home tournament and Stanford Open this past weekend. San Diego State gave Oregon a real scare at this tournament last year, but the Federalis results so far don’t suggest they’ll be able to sniff the upset win. The offense alone should be good enough to put Oregon in the semifinals this weekend, and there’s enough talent across the roster that calling them anything other than the odds-on favorite to win the weekend seems silly. But we’ll keep our eyes peeled. Fitness. #5 Colorado Mamabird has it every single year. If any team could be counted on to have the athletes to go step-for-step with Ego and generate turns, it’s Mamabird. Last year at Prez Day, lacking top contributors Pawal Janas and Wes Chow to injury, Mark Rauls handled the offense almost by himself, literally running through the competition while his teammates stayed in the shorts of every other team up through their semifinal loss to Washington. Assuming the training regimen hasn’t changed in Boulder, Mamabird will return to competition this weekend in good form. Along with Rauls and Chow, they have three more Johnny Bravo-tested veterans in Isaac Chestler, Josh Crane, and Erik Hotaling. Both Colorado and their club brethren Bravo have been riding a vertical stack system that makes hay on using the full width of the field. Rauls in particular is able to light up the open and break side lanes with his cutting speed. He has put more than few seasons of work into this system, and he’ll be wide open unless opponents can figure out how to effectively double or bracket him. 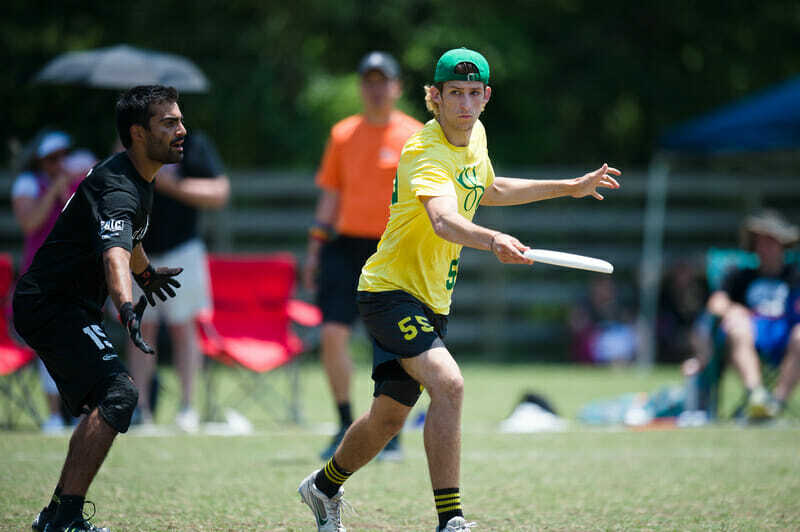 At least as of the fall, he didn’t quite have the cross-field blades and hammers that former Mamabird and current Bravo teammate Jimmy Mickle uses to keep the system churning, but Rauls has what he needs to stay dangerous in all positions. Mamabird shouldn’t run into much trouble with the three Southwest challengers in Pool C. UC San Diego and UC Santa Cruz are fine regional contenders, but neither has shown the kind of grit and coordinated team defense it takes to slow down a powerhouse like Colorado. UCLA gets to play the “Lucky To Be Here” card – they’ll attend this weekend thanks to a big win at the Prez Day Qualifier. The question mark matchup for Colorado will be with last year’s nationals Cinderella team, Utah Zion Curtain. That’ll be an athletic clash and in the early season these games don’t always go to the more experienced team. Give Mamabird the edge, and the nod to grind their way right into a competitive semi or final appearance. While #1 and #5 debut this weekend, #14 Cal Poly SLO, #15 Washington, and #21 Western Washington all arrive in San Diego with a quarterfinal finish or better at the Santa Barbara Invite in hand. WWU broke seed at last month’s kickoff event and should be feeling good. But Washington and Cal Poly both showed up at SBI thinking a tournament title was achievable and neither made it out of semifinals. For Washington Sundodgers, they lacked punch in Santa Barbara, almost certainly because their Sunday roster thinned as the day wore on. The accounted-for injuries didn’t slow them down early in the weekend, but food poisoning and a few on-field mishaps left them shorthanded in semis. Good news has been delivered for Washington. They should be able to ease almost everyone back into the swing of things this weekend for at least a few games, including powerhouse Khalif El-Salaam. D-line stalwart Jonathan Shuster is the only player out for the entire weekend. The Sundodgers have already handled UC Davis once 13-7, and that was without El-Salaam. They’ll bring their Northwest style vertical stack to bear on Illinois and Arizona as well, and neither team at this point has a rostered answer for the threats stacking Washington’s. Try to limit Washington’s deep game by sticking extra coverage in the deep space and teams will allow the backfield to run rampant and marshal the rest of the offense down the break side. Focus too much on jamming up the inside breaks Washington loves so much, and expect Steven Benaloh or El-Salaam to have a long shot dialed up for Cooper Schumacher. On defense, Washington’s already looks more aggressive than they did most of last year. They’ve been more fearless bidding for blocks on in cuts and they’ve had those opportunities thanks in part to much better positioning down field. The key to success for the Sundodgers this weekend will be maintaining consistency while managing their slowly healing injuries – not all top players will play in each game. They have nine rookies on the roster with their work cut out for them. It was less the injury bug that nagged SLOCORE a few weeks ago and more their mental game. Coach Peter Raines admitted that getting relentlessly punished by Stanford hucks at Santa Barbara was a wakeup call for his normally air-savvy defense. Cal Poly add captain Aaron Shi back this weekend, but are still without the hotly-anticipated recruit Jeremy Dolezal-Ng. Justin Ting, another standout rookie who did play at SBI, is probable this weekend. More games are just a plus for SLOCORE, who have already demonstrated that their capability to go on improbable runs to take over games this season. They faced multiple-point deficits more than once during pool play at SBI and overcame each of them. Blessing or curse, Cal Poly gets the toughest top-of-the-pool assignment at Prez Day: they have to go through Western Washington, the only two seed in a pool also ranked in the Ultiworld Power Rankings. Edging out Western Washington will require pressuring handler Dennis Casio into mistakes, something no team has done well so far this season. The small speedster is the engine that made Dirt go all the way to the final, so SLO will be in good shape if their ace defenders can keep him from seeing the disc on every other throw. Western Washington looked to be in midseason form when they scrapped into the final a few weeks ago at Santa Barbara. They have the speed on defense to keep up with their pool this weekend, and the discipline to play keep away long enough for other defenses to crumble. Along with Casio’s backfield prowess, Josh Kent was a lanky nightmare out of the stack and will draw attention from opposing defenses. There are two questions for Dirt. First, was their impressive on-field consistency to start the season just the result of measuring against teams that were starting at a deficit after a long holiday break?2 Second — if they are in better form than most teams right now — is their top speed a good enough to handle the elite speed of teams like Oregon and Colorado? Let’s all say an ultimate prayer and hope we get a game or two on Sunday or Monday that answers these queries. Utah Zion Curtain is out there lurking, with height and athleticism to punish teams that aren’t set defensively or too loose with their deep game. Zion Curtain made UBC pay last year at Regionals after an otherwise quiet season. This year, they make a nice, noisy appearance at a major regular season tournament and will get a rash of inter-regional matchups right on day one. The style of ultimate UC Santa Barbara has been playing isn’t exactly beautiful and Prez Day makes their third tournament in four weekends. Their huck accuracy was miserable at their home tournament, although their cutting form out of pull plays looked excellent. Hopefully a tough weekend at the Stanford Open was a good wakeup call and they’ll have some better looks on offense available to complement their — let’s call it fiery — defense. As mentioned earlier, The Weather went all-in pre-flop on this weekend. Thanks to heavy rain predicted Thursday-Saturday, the tournament has been shifted from its normal grass field locations on the UCSD campus to more limited turf nearby. It’s not changing the pools, but it is changing the schedule.3 Rounds will now be 75 minutes, down from the original 90. According to tournament directors, to adjust for time limitations, all intra-Southwest matchups have been removed from the day one scheduled and that’ll account for the time limitations created by the alternate locations. This format has been approved by USA Ultimate. All teams are guaranteed six games still. If you’re the Southwest, be happy about this. It’s one less chance to spend most of a tournament beating on each. Weather during the actual weekend should be a little bit rainier than the norm with ~10 mph winds in La Jolla. That’s nothing a bunch of practiced ultimate teams can’t handle. Just as it has hampered the tournament, the weather has thrown Ultiworld’s filming schedule for a loop. With the tournament now spread across multiple field sites, we will be limited in our access, but will still plan to film eight games on Saturday, with more power pool games and bracket play games to be determined throughout the weekend. Access will be available to subscribers or those with a Team Pack next week. Comments on "President’s Day 2017: Tournament Preview (Men’s)"